Places of interest to visit during your holiday at Camerons Cottage near Loch Ness in the Highlands of Scotland. They are all within easy reach and are good days out. If you can't fit them all in then you will just have to come again. Urquhart Castle juts out onto Loch Ness and is clearly visible from the opposite shore especially in winter when the castle is lit up. The new Visitors Centre is discretely set back into the hillside and looks out over the castle ruins, Loch Ness and the mountains beyond. It opened in summer 2002 and is well worth a visit- with an audiovisual display describing the castle’s turbulent history, an exhibition and medieval artefacts found during excavations. A short film show is available with a spectacular ending. Open all year. It was once one of the largest castles in Scotland but was blown up in 1692 to stop it falling into Jacobite hands. The castle is near the village of Drumnadrochit on the A82 and can be reached either by going east through the city of Inverness or by going west via Fort Augustus at the southernmost end of Loch Ness. Fort Augustus - a bustling village at the most southern end of Loch Ness, about 14 miles from Camerons. 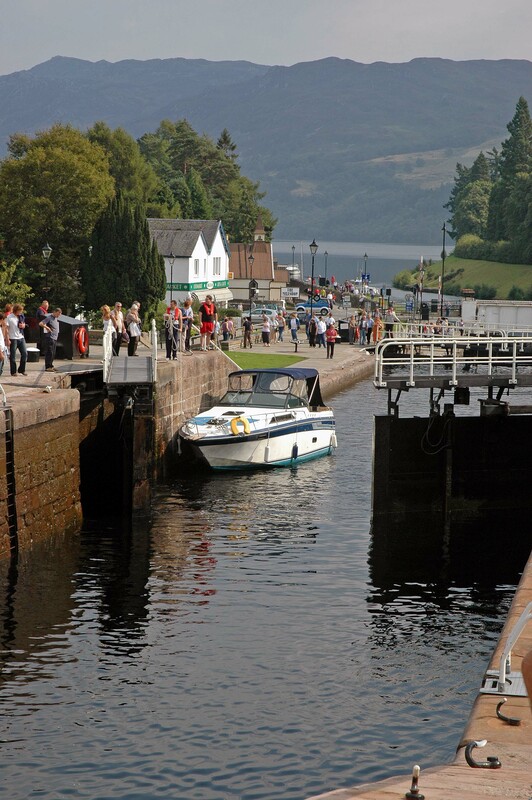 This is where the Caledonian Canal, with its many stepped lock gates, comes into operation for boating purposes enabling travellers to continue their journey. It is well worth a walk along the side of the Caledonian Canal watching the various boating craft in the lock gates waiting to go on their way. Various eateries, shops, petrol station. It is possible to travel from the east coast to the west coast of Scotland by various waterways along the entire length of the Great Glen. Dolpin watch at Chanonry Point on the Black Isle. Drive north out of Inverness over the Kessock Bridge and turn right at the first roundabout signed towards Rosemarkie and Fortrose on the Black Isle. Drive through the village of Avoch and then look carefully for the right hand signpost down to Chanonry Point. Drive down a single track road through a golf course [beware of flying golf balls!] to the car park. Follow a signed footpath to the sandy beach and wait. The dolphins come in on the high tide so times of sighting will vary during the year. Aim to get there about two hours after low tide. It is very exciting when they appear… also a great place for a paddle and a picnic. Fort George is a fascinating visit - a huge Georgian fort filling a headland, jutting out into the Moray Firth – opposite Chanonry Point. It was built as a base for George II's army following the defeat of Bonnie Prince Charlie and his Jacobite army at Culloden - in case the Jacobite cause was rekindled. By the time it was completed in 1769 the uprising had been firmly quashed, a shot was never fired and it has been used ever since as active artillery barracks. There is a visitors centre, exhibitions, historic barrack rooms as well as the regimental museum of the Queen's Own Highlanders. It is considered to be one of the finest fortifications in Europe. 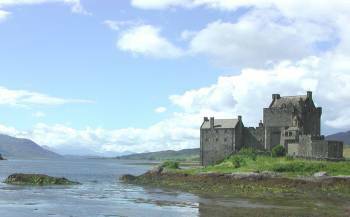 Eilean Donan Castle is on the road to Skye, about 8 miles from the Kyle of Lochalsh and well worth stopping for a visit. It is built on an island on Loch Duich and can be reached by buying a ticket and going over the narrow stone bridge. It consists of a 14th century tower house surrounded by a 13th century wall. The Isle of Skye is about 60 miles west of Camerons passing Eilean Donan Castle with plenty of breath-taking scenery along the way. At the Kyle of Lochalsh you can go over the Skye Bridge to the famous Isle of Skye. Skye is the largest, most northerly island of the Inner Hebrides, lying just off the northwest coast of Scotland. 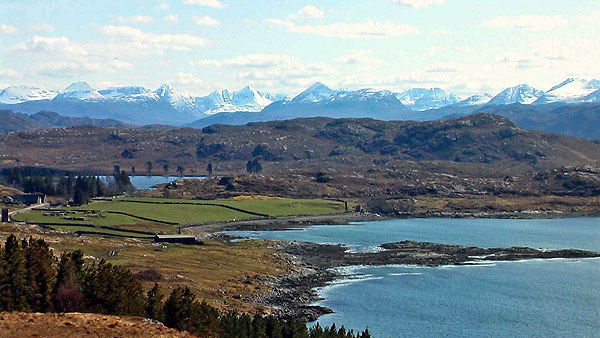 It is also one of the most scenic, with several peaks of the Cuillin Hills rising above 950m/3120ft. The bridge was started in 1992 and took three years to complete. It spans the narrow channel known as the Sound of Sleat linking Skye to the Kyle of Lochalsh on the mainland. Alternatively, if you do not wish to go over to Skye, travel on from the Kyle of Lochalsh and a short distance along on an inlet of the south shore of Loch Carron is the picturesque village of Plockton. Its scenic location makes it a popular touring spot and it is known particularly for its flourishing palm trees which grow in the sheltered warm west coastal winds. Fairy Glen Waterfalls on the Black Isle at Rosemarkie. A beautiful peaceful walk with a series of stunning waterfalls and wild flowers. Visit Corrieshalloch Gorge & Falls of Measach on the road to Skye. Park in the car park on the right and walk across the road down to these dramatic scenic sights. There is a good viewing platform and a suspension bridge over the Gorge with good photo opportunity. Not for the squeamish! This spectacular gorge is 1mile long and 200ft deep with sheer sides. Here the River Droma tumbles 150ft dramatically onto broken horizontal rock formation over the Falls of Measach. Rich diverse plant life flourishes here. Glen Affric has a reputation as one of the most beautiful glens in all of Scotland. It really is a picturesque glen with the River Affric rushing through it and opening out onto an island-studded loch, surrounded by a string of Munros. 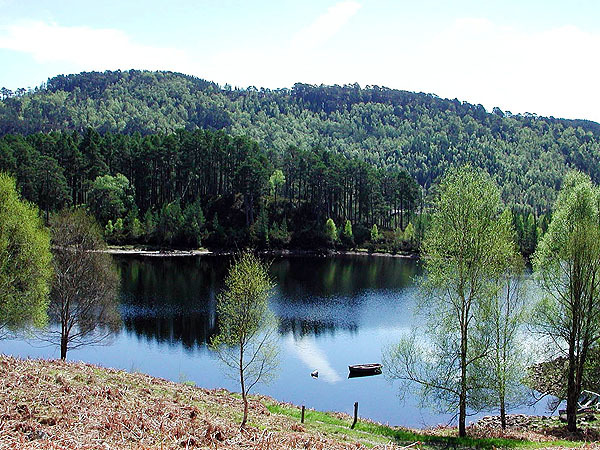 It contains one of the largest surviving native Caledonian pine and birchwoods in the United Kingdom. On a calm, sunny day, the reflection of the islands and surrounding hills and mountains is breath-taking and well worth the journey.Glen Affric is about 56 miles from Camerons – a very pleasant drive from Inverness through Beauly and onto Cannich then follow signs to Glen Affric. Drive about 7 miles along a single track road to the car park at the end. Cannich can also be reached via Drumnadrochit on the A82. Car park/toilets at the end of the track and some well marked walks to be enjoyed. Ideal for a picnic – either here or at Dog Falls back along the road where there are picnic tables provided and a pleasant river walk. 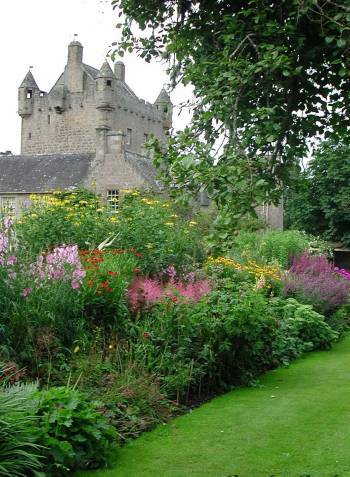 Cawdor Castle is about 30 miles from Camerons on the way to Nairn and is open to the public from June to October. An interesting tour inside through low doorways and up winding stone stairs. Beautiful gardens especially in the summer months. Go over the drawbridge and into the splendid house and home of The Dowager Countess Cawdor. Good food available at the nearby Cawdor Tavern in the village. The town of Nairn is about 40 miles drive from Camerons on the east coast passing Brodie Castle on the A96. A rather quaint town with a marina, shops, eateries and a marvellous long, sandy beach with sand dunes, ideal for a relaxing stroll. Can be busy in the summer months. Two championship golf courses nearby. Black Isle Wildlife Park - only 5 minutes from Inverness just off the A9. Cross the Kessock Bridge and take the first turning left at the mini roundabout. Take the under-pass for Drumsmittal are it is 1.5 miles on the left. Open every day from March to November. See an amazing wide variety of animals. Tea room/gift shop available. Picnic and play area. An ideal place for all the family. Highland Wildlife Park at Kincraig about 7 miles beyond Aviemore and about 50 miles from Camerons. View Scottish and European wildlife and endangered animals of the world’s mountains and tundra. Drive round the Main Reserve in your car and then explore the Walk-Round area to view the animals at close range. This Park opened in 1972 and, along with Edinburgh Zoo, is run by the Royal Zoological Society of Scotland. The latest additions are two polar bears. View the playful Amur tigers in their large paddock. Open every day except Xmas Day. A good day out. Dunrobin Castle is a 70 mile trip up the east coast to just beyond the village of Golspie. It is the largest house in the northern Highlands - an enormous fairy tale castle with a distinctive French-style look with spires and elaborate stonework, modelled on a Loire Chateau. It is one of Britain's oldest continuously inhabited houses by the Sutherland family, dating in part to the early 1300's. There is a fine display of antique furniture, china, tapestries, portaits, works of art and other luxurious goods acquired by one of the wealthiest families in the land. It is set in a great park with magnificent formal gardens inspired by Versailles. There is a very entertaining falconry display in the grounds every afternoon and a great chance to see birds of prey up close in their pens. Castle of Mey is at the end of a scenic journey right up the east coast to the Pentland Firth and not far from John O’ Groats. This was the favourite summer retreat of the late Queen Mother and you can almost sense her presence here still. The Queen Mother purchased it in 1952, after her husband’s death, and had it lovingly restored. After her death the castle now belongs to a charitable trust and is open to the public. 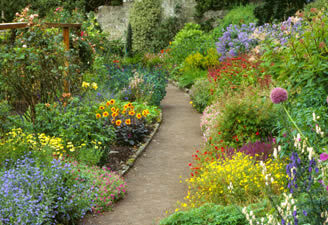 Beautifully maintained gardens. It is situated on the most northerly coast of mainland Scotland and has superb views over the Pentland Firth to the Island of Orkney and Scapa Flow. Dunnet Head Cliffs are not far from the Castle of Mey and are the most northerly point of mainland Scotland — not the famous John O’Groats as is widely thought. A picnic on the cliff tops watching the teeming bird life nesting in the cliffs and contending with the strong sea breeze is a real challenge but great fun. A bold sandstone promonotory 417ft high, with a lighthouse and views across the Pentland Firth to Orkney and along the north coast. Remains of old look out posts across to Scapa Flow where naval ships were based during wartime. Drive back through Strathnaver – a fertile valley extending 19 miles from Loch Naver to the north coast. It is very sparcely inhabited as it was the scene of wholesale evictions from 1812–1819 in ‘the clearances’. This was when local crofters were forcefully removed to the coast and their land taken over by more profitable sheep farming. These events are reviewed in the Strathnaver Museum at Bettyhill village on the north coast. Bettyhill has an unbroken arc of beautiful pure white sand which forms between the Naver and Borgie Rivers and is a popular surfing centre. Falls of Shin - just outside Lairg, off the B864 north of Inverness. Here you can watch the salmon leap up the dramatic waterfalls from the viewing platform above the River Shin between April & November. Enjoy the forest walks nearby. Restaurant and Harrods gift shop/car park. Findhorn Bay on the Moray Firth with beautiful windswept sandy beaches. Travel along the A96 east towards Forres and look for signs left to Findhorn Village. Walk along the clean sands at Burghead Bay. The River Findhorn flows northeast for a distance of 62miles from the Monadhliath Mountains into Findhorn Bay. Can be rather breezy but very exhilarating! Culloden Battlefield is 5 miles east of Inverness. It is a barren moorland which, in 1746, saw the end of the Jacobite uprising in the Battle of Culloden - the last ever battle on British soil. This battle is graphically described as an excellent audiovisual in the new Visitors Centre - open all year with restaurant & shop. Outside you can walk freely round the battle sites with flags marking the position of the two armies and clan graves are denoted by simple headstones. Inverewe Gardens is up on the west coast where a profusion of mature, rather unusual plants and foliage flourish in the area's famously temperate climate [a consequence of the Gulf Stream]. The gardens are protected by Loch Ewe's corrosive sea breezes by a dense screen of various well-established trees. Ullapool is 80 miles from Camerons on the west coast with its quaint white cottages and busy fishing harbour jutting out into the sea loch-Loch Broom. Travel up along the west coast from Ullapool on the A835 and turn left off to Achiltibuie where you can view the Summer Isles situated at the mouth of Loch Broom. The islands of Harris and Lewis in the Outer Hebrides can be seen in the distance on a clear day. Along the way you pass the conspicuous triangular shaped pinnacled peak of Stac Pollaidh [Stack Polly] at 612m/2009ft with a very rocky summit ridge - a favourite for really serious climbers who enjoy a challenge. There are some wonderful secluded pure sandy beaches up on the west coast often with a breathtaking backdrop of snow topped mountains. Stunning scenery on the west coast. Well worth the journey but much better appreciated in the days with longer hours of daylight. Study the weather forecast for the west coast before you go to gain full advantage of this dramatically beautiful scenery. Wonderful photo opportunites. Stop for a picnic and just relax and admire the stunning scenery. Secluded sandy beaches waiting to be discovered…..
..deer wander across your path-they have all the time in the world. Enjoy exploring the stunning scenery of the Scottish Highlands……… where a memory awaits you.